Information overload – all of us are stuck in this web of words. Many times, there are simply too many conversations to sift through to get to that one we are actually looking for. Well, while we aren’t sure about what to do with all the information overload, but here is a great iOS 7 messages tweak to organize your problem of organizing conversations on your iOS 7 powered devices! – Relevant read: Weatherboard iOS 7 Theme for Weather-Based Animated Wallpapers! 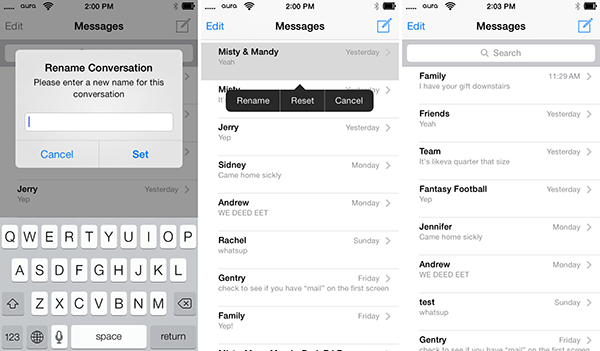 Developed by Atlas Wegman, MessageRenamer 7 iOS 7 messages tweak is a helpful tweak that will let you stay organized with the conversations in the Messages app. With the help of this tweak, you can label conversations to something more descriptive to quickly get the crust of it rather than trying to decipher it by reading the names or the conversation. You can get MessageRenamer7 iOS Messages tweak from Cydia for $0.99. Go to Cydia, Search for MessageRenamer7, install it and ta da! Go to the Messages app, tap and hold any conversation that you wish to rename. You will get option to rename, reset or cancel. Rename to whatever text you like! Simple. – Other iOS 7 JB tweaks and themes worth checking out!